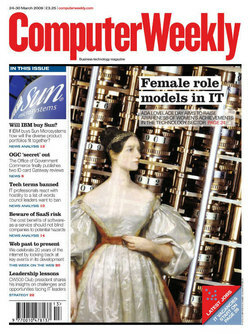 So, in honour of Ada, and as an encouragement to women working in or thinking of joining the IT industry, Computer Weekly is joining the Ada Lovelace Day spirit both in print and online. Ada is our cover girl for the 24 March issue, and inside we’re running a two-page feature article on female role models in IT from Ada herself, through to modern-day IT girls, software engineer and Girl Geeks founder Sarah Blow; Gillian Arnold, technical manager at IBM; Rebecca George, partner at Deloitte and BCS Women’s Forum chair; Karen Price of e-Skills; and freelance web designer Victoria Baker. Meanwhile, online, Heidi (our community editor) will be posting on this blog tomorrow on Katharine Berry, a young female programmer who created an online tool for Second Lifers, and I’ll be doing my best to round up some of the best from our archive coverage. Join us tomorrow for the celebration – and join in yourself by sharing your comments about women you admire within the field of technology. PS. If you want to find out more about Ada herself, you could join me in listening to this archived BBC Radio 4 programme on Ada, Babbage and computing from March last year. Not had time yet (I’m at work, after all!) but I’m hoping to get chance tonight.